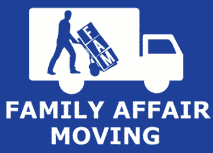 Family Affair Moving is Orange County’s professional, affordable and reliable moving company. Our company was built on hard work, dedication to our customers, and our pride in the quality of our work. Let our Family move your Family. Every member of our staff takes great pride in providing a professional demeanor and always with extreme care of your personal possessions treating them as if they are our own. Rather than relying on Extensive Advertising, much of our Business comes from Yelp, Repeat and Referrals from our many Satisfied customers over our many years in the business.